12 and 14 year olds success. seen a lot of deer. We told him we would come back later on and hunt. couldn’t believe that I got a deer that big. Congradulations to you and your brother on a couple of super bucks!!! You’re gonna have a tough time toppin that one you got there. But that’s what makes if fun. Trying… Nevermind the butthead posted here! He’s just jealous that you killed a buck twice as big as anything he’ll ever shoot. I bet you’re still really excited. 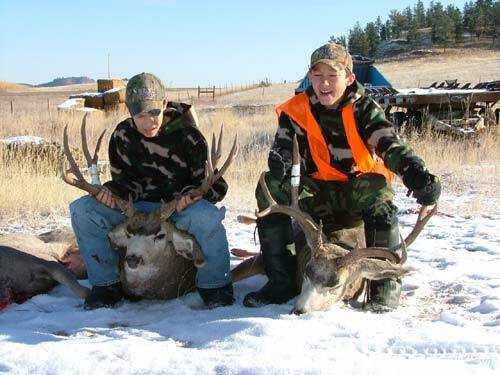 Hey there thats a couple of monster muleys. I am now 15 and have been hunting since I was 8 and have yet to even see a deer that big. (even in the off season) Congrats to both of you and good luck to you this coming season.